All dogs are at risk for ringworm, but the condition is most common in puppies less than a year old, and in older dogs with compromised immune systems. It is contagious to humans and causes a crusty, itchy skin rash. In humans, ringworm displays as round, ring-like sores. Ringworm is a fungal parasite (dermatophyte) that causes skin disease in pets and people. The parasite feeds on keratin, the outer dead surface of growing fur, skin, and nails. There are many types of dermatophytes, but most cases of canine ringworm are caused by Microsporum canis. Another type of ringworm, carried by rodents, may infect pups that dig through rodent burrows. The third kind of ringworm lives in the soil. Ringworm easily spreads to humans, and very young children, the elderly, or anyone with a depressed immune system are most susceptible. In people, ringworm infections spread outward from a central spot. As the inside central sore heals, the “ring” of reddened inflammation surrounding the area gives it its characteristic look and name. Puppies suffering from ringworm infection won’t necessarily show this distinct pattern. 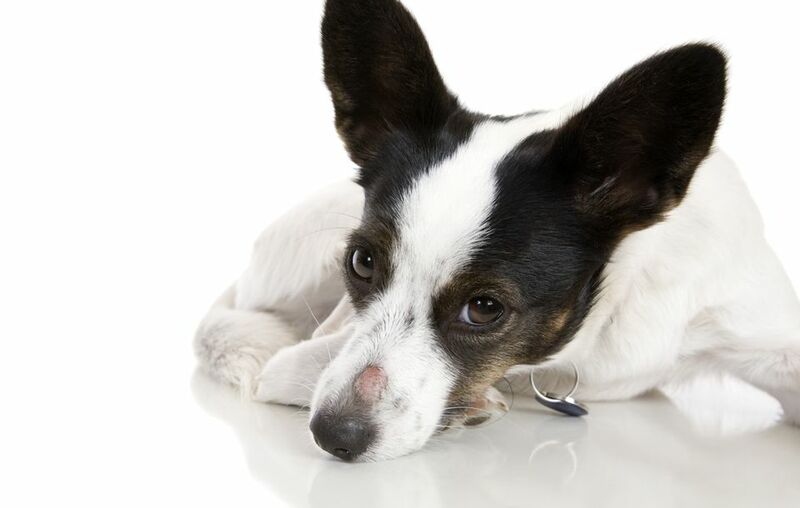 Sores expand but not in rings, and can look like a variety of other pet skin diseases such as ​skin allergies. Typically there is scaling and crusting at the margins of bald patches, with broken or stubbled hair in these areas along with variable itchiness. The dermatophyte lives only on hairs that actively grow. The infected hairs break off and leave a stubby patchwork fur pattern, and mild to severe crusty sores also can develop. Some pets become itchy, others do not. The inner hairless regions appear clear as they start to heal. The face, head, and forelimbs are the first areas affected, but the fungus potentially can spread and affect the pup's whole body. Healthy adult dogs often resist ringworm infection because their immune systems squelch any exposure. Some healthy pets become “typhoid Mary” carriers, meaning they have no health problem themselves, but spread an infection to other animals. Once a pet becomes infected, spores contaminate the environment and can remain infectious for months. The condition is transmitted by direct animal-to-animal contact usually from infected hair or skin debris. However, ringworm is also transmissible from contaminated grooming equipment, and can even be picked up from dermatophytes in the environment. If one pet in the house is diagnosed, all should be treated whether showing signs or not. Infected pets should be quarantined from those not showing signs. Canine ringworm is diagnosed by identification of the fungus. The veterinarian may use a Wood's Lamp to screen suspect cases; about half of M. canis cases will "glow" when exposed to its ultraviolet light. Other times, a skin scraping collects debris from the lesions, which is then examined microscopically. Many cases are identified using a culture test that grows the ringworm fungus. A sample from the lesion is placed in a special medium designed to grow ringworm. It may take up to three weeks before the test indicates a positive result. In most cases, otherwise healthy dogs self-cure in 60 to 100 days without any treatment at all. However, in severe cases and when the infected pet may expose humans to infection, specific topical or oral antifungal treatment may be recommended. Be cautious about medicating sores with anything prior to a veterinary examination. That may interfere with an accurate diagnosis. Treat only after your veterinarian diagnoses the condition, and follow post-treatment recommendations. Ringworm fungus is difficult to eradicate. Human products like athlete's foot preparations aren't effective. Neither are captan or ketoconazole shampoos. The only topical treatment proven to be effective in controlled studies is a lime sulfur dip, but it smells like rotten eggs. Longhaired puppies must be clipped first to reduce the amount of contaminated hair (remember to disinfect the clipper blades afterward). Avoid shampooing or scrubbing the pet when you bathe your puppy because that can make the infection worse by breaking off infected hairs and spreading the spores over the body. Ketoconazole, which is only for dogs, is probably the most common drug used to treat ringworm. The drug griseofulvin (Fulvacin) is also very effective. Once swallowed, it is incorporated into the growing hair where it slows the growth of the fungus. Your veterinarian will recommend the best choice for your situation. In addition to treating your puppy, you must clean its environment. That’s easier said than done because the ringworm spores are nearly indestructible. But treating the environment helps reduce the numbers of fungal spores, and helps prevent reinfection. Only concentrated bleach, cancer-causing chemicals, and enilconazole (which is toxic to cats) have been shown to effectively kill ringworm spores, and none of those options work well in your home. Currently, experts recommend environmental control by daily cleaning of all surfaces using a diluted bleach solution (one part bleach to 10 parts water), along with thorough vacuuming. Get rid of spore reservoirs such as carpet, drapes, pet bedding, and the like. High-temperature steam also may be effective. Vacuum repeatedly, but remember to toss out the bag every time, or you’ll simply spread the spores. Disinfect the vacuum, too, with the bleach and water spray. Sunlight also kills ringworm spores. Anything that can’t be thrown away or bleached can be left outside in the bright sun for a couple of weeks. You must treat the puppy and continue disinfecting the environment until follow-up cultures of the pet are negative. In a single pet home, treatment may be needed for three to eight weeks and longer in multi-pet households. When an otherwise healthy pet develops ringworm and is not re-exposed, the lesions typically will self-heal in about three weeks even without medication.